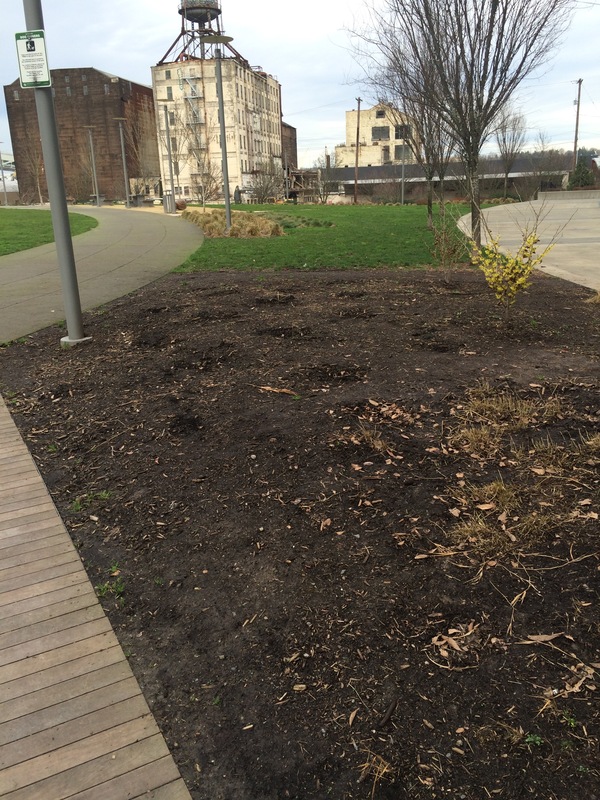 Published February 4, 2016 at 2448 × 3264 in The Fields Park: Brownfields, Compaction & Drainage – a Missed Opportunity. The portion of this bed was all planted in Fothergilla gardenii. Virtually all of it died. Some was replanted and died again. This area is poorly drained and also suffers foot traffic between the two hard surfaces. Closer, you can see the remaining stubble of the surviving Hakonechloa grass, a warm season grass that ‘disappears’ in winter so is subject to being stomped out. The Hamamelis was a later attempt, providing the stature to force pedestrians around it. Overall the designers ignored the growing conditions, the human pressure while attempting to impose a too simple broad aesthetic to this Park setting.